Like most of his books, Mr. Riordan’s second installment in his Kane Chronicles has positive and negative elements. I won’t object to my kids (12+) reading them, but I don’t push them, either. The books are exciting, imaginative and funny, a combination that has made them wildly popular with middle school kids. But they also delve into some subject areas that make this mom a little uncomfortable. I do appreciate that Mr. Riordan keeps the language pretty clean. As always, he has some oh my gods jokes, and this one does use the word “bloody” an exorbitant number of times. That would probably concern me more if I were British. As it is, I mostly though it an overused expression, but others might find it objectionable. He also keeps guy/girl activities very innocent. The hazy area comes with the spiritual nature of his books. This is a fantasy about ancient Egyptian gods. I know it’s fiction. I don’t believe in them, nor do I think it will influence my kids to pick up pagan religious practices. But I also believe there truly are spiritual forces, good and bad, so it makes me a little squeamish when the kids (13 and 15) in the story start channeling the gods’ powers, merging with them, using them, welcoming possession by them. I definitely want my kids to have a very solid knowledge of spiritual reality before they start diving into this kind of fantasy. Hence my 12+ age recommendation. Another thing that bothers me a bit about these books is the absence of a solid line denoting right from wrong. Harry Potter contains some of these same issues, but the readers always know the good from the bad. With these ancient gods, that’s very nebulous. “Chaos” is negative and “Ma’at” (balance) is positive. The kids make deals with Set, a Chaos guy who actually helps them, though he is aiding his own purposes by doing so. Still, that line blurs. Meanwhile, Horus, one of the “Ma’at” guys, is “a good guy in many ways—brave, honorable, righteous. But he was also ambitious, greedy, jealous, and single-minded when it came to his goals.” So is he really worth cheering for? The line is hard to follow. Sadie and Carter, at least, do demonstrate very admirable qualities: friendship, sacrifice, loyalty, putting family first, their desire to save the world. Anyway, let’s move along to plot. In this book, Apophis, a great and evil proponent for Chaos, is rising. In five days, at the moment of strong magic on the spring equinox, he will break his ancient bonds. To counteract him, the brother and sister team must awaken Ra, the god of gods who has been asleep for two thousand years. The instructions they need are in the Book of Ra, which has been broken into three sections and hidden separately. And the House of Life, that ancient alliance of magicians, is seeking to stop them. Their final mission takes them on a race against time down the River of Night in a leaky barge. It’s definitely high excitement. And the silly details that make Riordan such an interesting story-teller are not absent. Take Bes, the dwarf god, who strips down to his “Ugly suit,” a blue Speedo and nothing else, (“His back was so hairy it looked like a mink coat. And on the back of his Speedo was printed DWARF PRIDE.) to frighten away demons. Or how about Sunny Acres, a retirement home for forgotten gods, many of whom drool and smell and tote around iv poles? This guy certainly has an imagination. Overall, how would I rate The Throne of Fire? It’s fun, but approach it cautiously. I have yet to read any of these books. I know I need to. My TBR list just keeps growing and growing! Lol, ditto on the TBR list! While these aren’t favorites, they’re fun. I like his Percy Jackson series better. 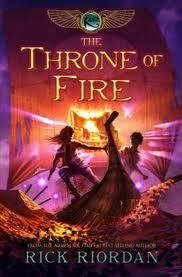 I read the first book in this series but didn’t like it as much as the Percy Jackson series. I’m not sure I’ll pick up the second book. But thanks for the great review. Thoughtful and extremely well written review. However, my wife and I like The Kane Chronicle books as much as, or maybe even more than, the Percy Jackson books. I would not hesitate to recommend them to children ages 9-12, but your warnings will be helpful to many parents. Again, good work. I think they’re more involved than Percy Jackson. I don’t mind my kids reading these, but we do it with some discussion. 🙂 Books make great discussion starters! I love this series! I want to read The Serpent’s Shadow soon! My mom is pre-reading it (as usual) 🙂 I like how you tell what you really think in your reviews. Friday I was at the University of Pennsylvania Museum (for the 40 winks with the Sphinx – you get to sleep over IN THE MUSEUM) and my friend (who can somewhat read heirogliphics (egyptian writings) and I think we found part of the story of Moses on one of the artifacts in the sphynx room. How cool! The story of Moses and the Passover and the Exodus is my very favorite Bible story. So, was your sleepover anything like the movie “Night in the Museum,” lol? My kids love that one! Wow, I’m impressed that your friend has some knowledge of hieroglyphs. Is he a kid? Yes he is a kid – he’s ten – like me! It was similar to “Night at the Museum” – there was a mummy on the loose! 😉 It was really cool that we got to do a flashlight tour of the museum (with a mummy on the loose) and we got to sleep in front of the sphynx in the Egyptian room. We saw an arm pushing a basket down the Nile with a boy in it on the artifact. Wow! Sounds like an awesome party! Am trying to play catch up, now that I am back home. I’m sure the kids like this series, as Erik does, but as a girl, it wouldn’t have interested me in the least. I appreciate your honesty in your comments. You always write a great review. Understand why you changed the cover of The Quill Pen — much more exciting. I read it while on vacation and couldn’t put it down. It was unpredictable, so it kept me wanting to read the next chapter. Lots of twists and turns. Didn’t expect the ending at all. Great read. I enjoy your writing style and your use of words. It was a great stand alone read. I eventually want to finish the trilogy — Broken Ladders and the Color of Freedom. Since the trilogy is historical fiction, I am thinking about reviewing them at some point. Thank you. The problem is my husband always has his iPad. And, I have Kobo. I do like having a book in my hand. I may go ahead and review The Candle Star and hold it. Again, thanks — you gave me many hours of reading pleasure.